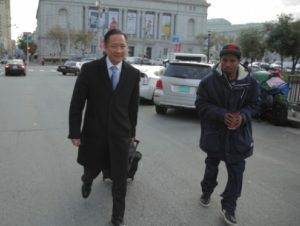 San Francisco—A film highlighting two cases in the San Francisco Public Defender’s Office received the ‘Best Documentary’ award at the Independent Television Festival Sunday. ITV Fest, which was held Oct. 11-15 in Manchester, Vermont, focuses on episodic series created by independent filmmakers. The festival represents a worldwide community of television creators, executives, agents and fans responsible for discovering the best new television programs created on independent budgets. Adachi said he was honored by the award. A free screening of Defender will be held Saturday, Oct. 21 at 1 p.m. in the Koret Auditorium in San Francisco Main Library. A Q&A will follow with Adachi, Professor James Lance Taylor of the USF African American Studies Program at the University of San Francisco, and Troy Williams, editor of the San Francisco Bay View.